Because well-begun is half done. The purpose of the first sentence in your essay is to make your reader want to read your next sentence. In truth, every sentence you write has the same purpose: to keep them reading to the end. So, you have to start off strong. Your first sentence has to have some impact on the reader or you risk your essay being tossed aside never to be picked up again. Try to feel my pain. As your reader, the last thing I want to read is some dry announcement about your plan for your essay, “In my essay, I will blah blah blah.” Yuck! I would rather read a grocery list! And you can do better than that. 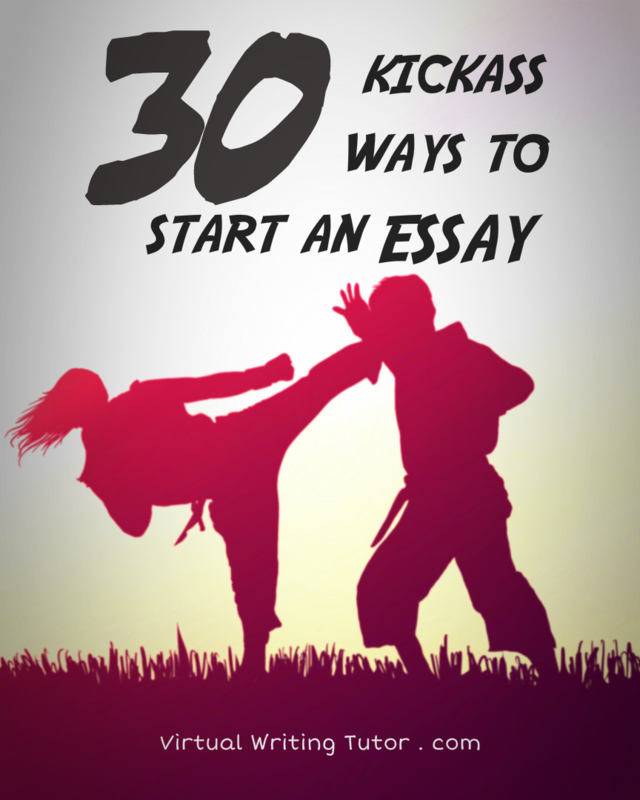 A martial artist once told me, “If you want to win a fight, hit first and hit hard.” With that in mind, here are 30 sentence types that will hit your reader hard at the beginning of your fight for his or her attention. My advice to you is to take 30 minutes to compose 30 of your own sentences using each structure and example to guide you. Don’t labour over each one. Some will be easy. Some not so much. 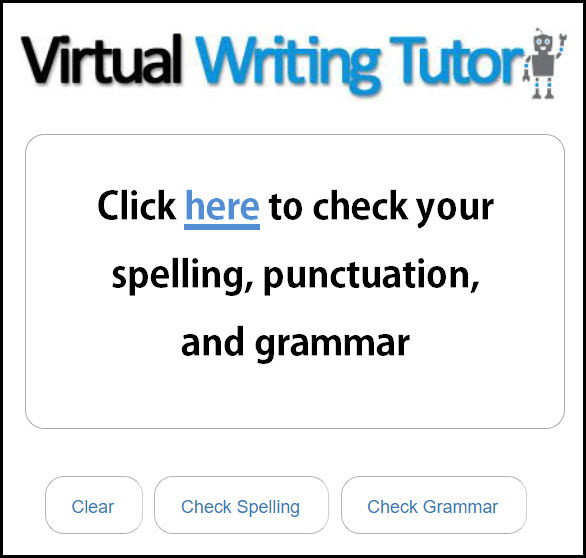 Once you have your list of 30 kickass sentences, copy and paste your own sentences into the Virtual Writing Tutor grammar checker to check for errors. 1. Not this, but that. Example: A moral code is not a hindrance to true success–it’s a necessity. Structure: ____ is not a ______ — it’s a _______. Comment: Say what something is not (or should not be) so that you can say what it is (or should be). Notice the dash. It joins two short sentences, one negative and one affirmative. You can join your sentences with a semicolon or a comma* if you prefer. *Strictly speaking, using a comma to join two sentences is usually called a comma splice error, but because the sentences are short, your reader will will interpret the sentence as a stylistic sentence rather than a comma splice error. 2. Use “better off than” to highlight an advantage. Example: A society with minimal restrictions on the expression of ideas and opinions is better off than a society with a propensity to censor. Example: A person with talent is better off than a person with training. Structure: ________is better off than __________. Comment: The phrase “better than” compares two things directly, whereas the phrase “better off than” compares starting points. It tells the reader that one has an advantage the other doesn’t have. Example: Being realistic is better than being heedlessly optimistic. Structure: Being _______ is better than being ________. Comment: Nouns are easy to compare, but when we compare adjectives we need the word “being” in front of them. This structure makes short, punchy claims easy to write, which make it easy for your reader to keep reading. Example: Apathy is just as harmful to humans as a physical disease. Structure: ____ is just as _______ as _______. Comment: If you are asked to discuss to two things and give your opinion, it can be a good idea to show how two things are equal in way before getting into their differences. Example: Between the nation state and the individual, the nation state is more important by far. Structure: Between X and Y, X is best. Comment: By offering two alternatives and then naming the first alternative again with a claim to its superiority, you create a sentence with a repeated element. The repetition creates an impact by making the repeated element more memorable. Poetry and song lyrics use repetition with this same intention. Example: Courageous deeds fit into a range of categories. Structure: Xs fit into a range of categories. Comment: After an opening sentence like this, you must keep your promise to categorize examples of “courageous deeds” into multiple types. Example: Dreams go beyond career choices and material desires. Structure: Xs go beyond Ys and Zs. Comment: Notice how the three items in the example are all plurals. Keep your items parallel when using this sentence structure. Also, notice how saying dreams go beyond make dreams bigger and more important than the other items mentioned. Readers will be curious how. Don’t disappoint. 8. Say where concepts originate. Example: Established values in a society originate in culture, religion, and the hopes and dreams that a country was founded upon. Plural Structure: Xs originate in Y and Z.
Singular Structure: X originates in Y and Z. Comment: Saying where something originates opens the door to illustrations from the past. An essay with a first sentence like this will practically write itself. Example: Even with the divorce rate of 50% Americans remain dedicated to the idea of family and community. Example: Despite a string of serious allegations, voters continue to support their president. Structure: Even with / Despite _______, Xs remain _________. Comment: Sentences that show us the surprising resilience of a state of affairs despite a factor that works against it make readers curious about why it is so. Make no mistake. Notice “even with” introduces past and present situations, while “even if” tells the reader about the future. Example: Good manners have virtually disappeared from our self-centered world. Structure: ___ has virtually disappeared. that good manners have virtually disappeared, that is much harder to contradict and should arouse curiosity instead. 11. Imagine a world without something. Example: Imagine a world without the light bulb, without civil rights, or without the personal computer. Structure: Imagine a world without ___, without ___, or without ___. Comment: Imagining a different world arouses the reader’s imagination and curiosity. All you have to do after a sentence like this is to offer illustrations how life would be different. Easy. 12. Say what is important to do before taking action. Example: It is very important to attempt to understand people’s motivations and circumstances before judging their actions. Structure: It is very important to ____ before _____. Comment: This is a way of telling your reader what to do without directly telling your reader what to do. You merely point out what to do first. Example: Lincoln, through the force of his character and his knack for politics, kept the United States united and ended 250 years of slavery. Structure: X, through the ______ of his/her character, ________. Comment: This sentence is very useful for making claims about people who have shown leadership or talent in the past. By painting a portrait of a great person, you will activate your reader’s memory and imagination. Example: Most people agree that the amount of preparation is proportional to the degree of success for any endeavor. Structure: Most people agree that ____. Comment: If you say, “all people agree that” or “all people know that,” your reader will resist you because it will sound like an exaggeration. Using the words “most people” still sounds bold, but it makes your claim sound less extreme. Example: Nowadays, creativity manifests itself endlessly, in all fields of study. Structure: Nowadays, _________ manifests itself, in _______. Comment: “Manifests itself” is just another way of saying “appears,” but it sounds more active and impressive. The adverb “endlessly” isn’t an essential part of this structure. It is not an exaggeration in the example sentence. I think it is true. We live in a very creative age. 16. Say what experts have observed or noticed. Example: Philosophers and scientists have observed that perspective colors perception. Structure: ______ have observed _____. Comment: This is a useful alternative to the word “said.” When you say that experts have observed something, they have seen it and talked about it. Notice how “to observe” is a little ambiguous. It can mean strictly “to watch and see,” but it is often used to mean “said.” The ambiguity prevents the reader from thinking, “Oh, yeah? Really? Where have they said that? Cite your sources!” Ambiguity at the beginning of your essay reduces resistance to your initial claim and keeps your reader reading. 17. Say how reflecting on something often leads to something else. Example: Reflecting on the condition of modern society often leads to the question, have we become overly cynical and desensitized? Structure: Reflecting on _____ often leads to the question ______? Comment: When you tell your reader reflection leads to curiosity about something, your reader will reflect and become curious. Kickass! 18. Claim that a virtue leads to harm. Example: Sometimes the realization of one’s personal goals can cost another theirs. Structure: Sometimes _______ leads to ________. Comment: The irony that a good thing leads to a bad thing for others will arouse your reader’s sympathy and moral indignation. This sentence structure is a powerful first sentence in an essay. 19. Say that the world once believed something. Example: The world once believed in things that we now find either horrifying or ridiculous. Structure: The world once believed ______. Comment: This sentence flatters your reader that he or she is not so stupid as the stupid people in the past, with their ridiculous ideas. Your readers will like the way you make them feel good about themselves. 20. Say how the greater part of something depends upon something. Example: The greater part of our happiness or misery depends more upon disposition than circumstances. Structure: The greater part of _____ depends more upon _____ than _____. 21. Introduce a criticism by saying X is often accused of something. Example: The media is often accused of sensationalism and outright bias. Structure: _______ is often accused of ________. Comment: This sentence makes the accusation sound unfair. It will arouse sympathy and moral indignation in your reader. 22. State a universal need. Example: The need to belong is universal. Comment: There are many things that are universal. Use this structure to tell your reader. Example: The purpose of education these days seems to be a straightforward one. Comment: These are two useful words that when placed side-by-side become even more useful. “Seem” suggests that things could be different than they appear. This arouses curiosity. “Straightforward” suggests simplicity. We all want to be rescued from confusion and excessive complexity. Example: The role of government has been debated for ages without any concrete answer being offered. Structure: _____has been debated for ages. Comment: When you start an essay like that, I’m expecting that you will settle the debate. Keep your promise. Example: The search for answers to all of life’s mysteries is an inherent part of the human psyche. Structure: _____ an inherent part of the human psyche. Comment: There are lots of things that are inherent to the human psyche. Memorise this structure. It could be useful to you. 26. Claim that there is little or no correlation to something. Example: The truth and facts have little or no correlation to what is popular or mainstream. Structure: _____ have little or no correlation to ______. Comment: Oh, really? Not connected? Do tell. This sentence is bold and arouses my curiosity. It will arouse your reader’s curiosity also. 27. There can be no doubt. Example: There can be no doubt that problems will continue to plague humanity far into the future, problems as diverse as the people they afflict. Structure: There can be no doubt that ______. Comment: People are attracted to certainty. Offer some to your reader. 28. Tell us that “nobody is free from” something. Example: Today, nobody is free from the demands or expectations of others, whether one is a toddler and expected to walk by certain age or a father expected to provide a comfortable life for his family. Structure: Nobody is free from _______. Comment: Everybody wants to be free. It is unfair that people should be unfree. Every reader will want to keep reading after the first four words. 29. What forever remains? Tell us. Example: Two opposing ideals remain forever in competition. Structure: _____ remain forever _____. Comment: Putting the word “forever” after the word “remain” seems a little old-fashioned and formal. It will make you sound like an authority on the subject. Example: Without passion optimism and the willingness to believe in the past, many accomplishments in this world might never have come to fruition. Structure: Without _____, _____ might never have come to fruition. Comment: This blog post might never have come to fruition if I hadn’t bought “30 Model Essays” and been impressed with the first lines of each essay. I hope you found it useful.